NOR for Kerikeri Family event race. The race details can be downloaded from here. I hope you all enjoyed your delivery sail from Waitangi to Opua. We had a nice little breeze and the incoming tide helped us home. I wanted to say a big thanks to all the parents who are able to volunteer their time either before or after sailing and help me get the kids out sailing and packed up. Next week sailing is on from 3-6pm as per usual. We will do the Flying V drill play ball tag and learn to sail backwards. For the teenagers we haven’t seen you for ages. Put down your PlayStation for 2 hours and come out for a sail. I will make sure we leave 2 420’s for you to sail and when you get out there I can swap you in for a sail in the splash. It was great to see so many BOIYC and OCC sailors out on the water on Sunday in probably the best racing breeze we have had for two months. We are hoping to see more boats out on the water for our next regatta on the third of July. 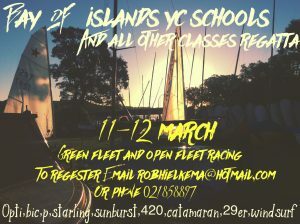 I have a confirmed starter from Russell boating club And with any luck we might get some KCC sailors joining us as well. So talk to your friends at school, teams racing circles and your coffee groups and let’s make it a regatta to remember. Remember to bring your Red Sox to celebrate Sir Peter Blake. I have some family visiting so I’m hoping to move our session to this afternoon slot. For those that come on a Saturday let me know if this works? You might have time to go mountain-biking in the morning. We will be working on pointing (sailing up wind close to the wind) and sailing by the lee (sailing as low as you can without gybing down wind.) as well as throwing in a bunch of fun games, lollies and general good times on the water. 3 races scheduled to count towards our winter series points. Races 21,22,23 of the series. Coaching plan: tactics all week long. talking thru the golden skills poster and other tactics on the water. I look forward to seeing you all during the week. Good sailing and fair winds. I have organised parents to take on some sprint racing tonight and Thursday. Get out for a good sail enjoy having no one to critique ur technique. I will see u again on Friday night 330-630 we had 16 boats last week so let’s see if we can break the record!! Friday’s theme is to talk about rules, port starboard, windward leeward, overtaking boat, luffing rights, buoy room. What to say and how to avoid a crash. Saturday 1030-230 coaching. We will try this new start time!! Focus will be 2 handed boats but other classes will be included. Keen to start working on settings, testing and getting our tuning guide together. A big focus will be changing settings on the water between drills and races. Sunday 9-12 go racing group. We will build on our rules knowledge and really try and use these on the water. Sunday 1-4 winter series race day 3 great sailing again last week, pot luck dinner again straight after sailing. It was great to have such a fun social Sunday at the club. Tuesday 330-630 Single handed sailing the focus is on showing off your sweet moves backwards sailing, circles, accelerations rail ride etc. Races to finish the night. We are focused on rules and mark roundings with a bit of information about wind and how to make the most out of a gust. Boat handling: warm up drill roll tacks and roll gybes around a short windward leeward course. Mark rounding: follow the coach boat, when I blow the whistle race to the top mark. Stop halfway downwind, follow the coach boat again, when I blow the whistle race to the bottom mark. Starting: 3-minute starts, stay inside the square starts. You will use lots of rules as all the boats are close. Races to finish. Racing around the trapezoid course. The wet bix triathlon is on, so access to the club will be possible by 2 methods, driving around the back way from haruru falls and parking in the treaty grounds car park, then a short walk down to the club. Or I can pick you and your gear up from Waitangi beach in the chase boat. The waitangi bridge will be closed untill 1230. Please tell me if you are coming so we can work around the triathlon. I’m hoping to see our biggest turn out for Sunday racing. There are no regattas on and I hope to have a big fleet of optis starlings and parents racing. So dust off your boats and get ready to sail! Club starlings and sunburst are available and I can help you rig up. I will be running a coaching course over the school holidays for learn to sail for level 1 beginners and level 2 learning to sail faster. For kids age 8-12. Please pass on this information to anyone you think might be interested. Anyone else who wants to go sailing there will be a chase boat on the water so get out there. Sunday am there is a regatta on at Kerikeri cruising club. Registration 9am, race starts at 10. We will not be doing our normal learn to race group we want to encourage everyone to race. This will be great practice four our learn to race group. Sunday pm we will race back to waitangi. If anyone needs help to get their boats up to kerikeri please call me. I will be taking the chase boat from waitangi to kerikeri on the water. Hi team we have a big week of sailing planned for you. The focus this week is on lift, sails and foils. So here are some things to think about and research before your next training session. Lift, sail trim, the slot between the sails, bi plane vs single wing, pumping, flicking the leech, rolling, underwater lift, sculling rocking, angle of centreboard. Feeling the boat from response you get from the rudder. Heel of the boat, rounding up or bearing away. If the rudder is heavy you are not flat. Boat handling 10 timed tacks and gybes every 15 seconds. Mark rounding practice, follow the leader and hoist, bottom mark drop and around. Repeat 5 times. Starting drills, transit drill hand up when on the line, stay inside the box starts. Tactics, split pairs one boat left one right see who wins. Discuss with the other boat why. Mark rounding diamond shape drill lots of mark roundings. Starting transit drill raise your hand when you are on the line then 5 practice starts. Races with one selected person to start 10 seconds early. They have to defend and the others attack. I am formulating a plan for this weekend so I will get back to you about that ASAP. This week we are on for Thursday 2 handed coaching. We are all go for Friday learn to race group. Saturday am, I’m going to spend some time at lake Manawai to try and convince some kids to come sailing in the ocean with us. Saturday pm there is a match racing regatta at Opua yacht club in their club 420’s. I encourage fathers mothers and their children to join in on the fun and fly the flag for bay of islands yacht club. Registration is 330 racing from 4. There will be heats and sudden death until the finals. Dinner and a band at the club afterwards. Sunday pm I will run racing, we will be low on numbers with many of our starling sailors in Auckland with regattas. Please email or txt me if you are keen to race on Sunday so I can prepare. I might tow a boat out to the race course and join in on the racing action. Parents come and race, club boats are available so don’t be shy. Also here is some information about youth class training good info and will help everyone to understand the next step. In competitive sailing after/at the end of your starling career..
Less competitive less expensive opportunities also available!!! Talk to me and we can set goals. The regatta is sailed in the first weekend of December in the superb sailing waters off Torbay Auckland. It hosts the most commonly sailed centreboard dinghy classes in NZ. Conditions were fine on day one, gusting 15 knots, day two showers in the morning clearing by midday, gusting 15 knots max . 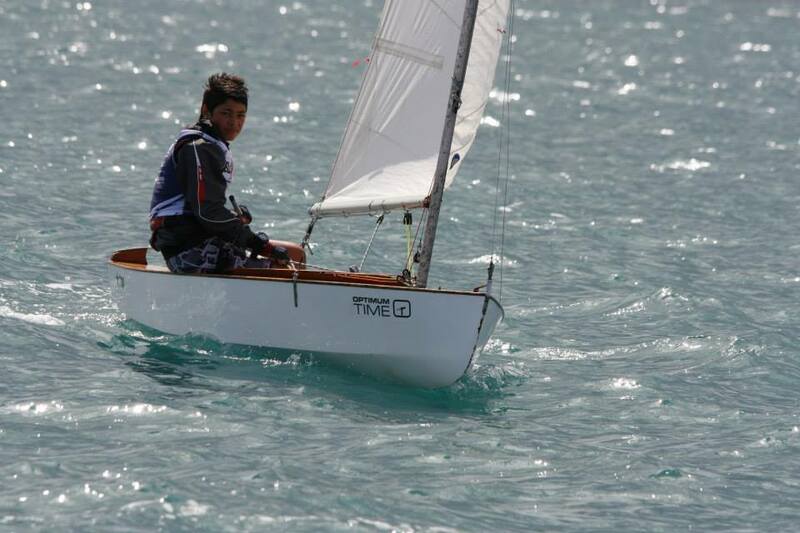 Overall race results 5th place for Horima Neville competing in the Green Fleet Starlings. There were many newer more equipped Starlings out there that came back in beaten up and broken, but Horima kept on charging on finishing on a strong streak. This shows the value of racing to the best of your knowledge and sailing spirit. 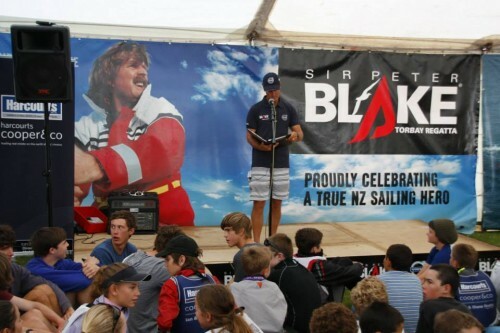 OCC congratulates Horima whom showed a competitive edge and sportsmanship, this is exactly what Sir Peter Blake would have wanted to see in New Zealands sailing youth. As in his life, his values and his passion for sailing. OCC is proud to have Horima being apart of the youth sailing program and thank his parents Trina and Russell Neville for their continued support for all the OCC youth sailors. I went down the hill as fast as I could. I was eager to get there and see the new starling. We got the starling because Jono wants us to go in sailing regattas and sail against kids our age. The splashes are really to big for us kids; usually only adults sail them but we still have fun on them. Wewere fund-raising for three starlings but we got them given thanks to Mrs and Mr Potter, Mrs and Mr Devlin and Mrs and Mr Crawford. When I got down to the youth sailing shed Jono asked me if I wanted to try out the new starling and I was really exited to do so. So I started rigging up the new boat. It is really different to the splashes. First the cockpit is really deep, the mast has side stays, the boom is low, it has a really tall mast for the size of the boat, and its made out of wood not fibreglass. We went and launched the boats. I had never sailed a starling before and how it sails is also a bit different, it can’t reach as high as a splash and I know that because I was pushing one of the splashes up into the wind we had our sails pulled in the same and my sail started to flap before the splashes. I might be wrong but that’s what I felt. Also the floor vibrates because the floor is also the bottom of the hull when splashes have space between the bottom of the hull and the floor. I also capsized and found out that the boat fills up with water and I lost my bailer to make it worse.I really enjoyed my first time on a starling and thank you once again Mrs and Mr Potter, Mrs and Mr Devlin and Mrs and Mr Crawford for making this possible for me and my mates at youth sailing. another wet and windy day out on the water, good to see some keen kids out there.very good starts to the races. some great things to come from this, some new boats in the pipe line, watch this space. Final class, amazing how 6 weeks disappear. today the kids each got a blast on a splash, they really enjoyed it and they are all keen to continue sailing. 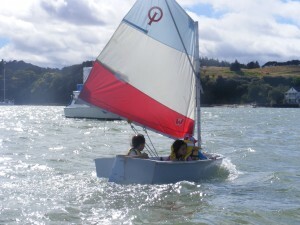 I must say again, a big thank you to Ian Templeman, Les and Chris Alderton with out you this wouldn’t have happened, and a big thanks also to the keen well behaved kids from Kawakawa Primary School, your welcome to come to sailing any time. that’s all from me, see you kids on Sunday.